Today is the celebration of St. Willibrord, a British-born, Irish-trained, Roman-commissioned Benedictine who evangelized the Netherlands (or in the words of the Roman Martyrology, "Friesland and Denmark"). - from St. Alcuin's Life of St. Willibrord. 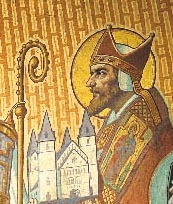 St. Willibrord, lead the people who call upon thee, through thine intercessions, into the fullness of truth and into unity with thy Church, that with thee and all the saints they may give glory unto thine all-merciful Lord, Who, with the Father and the Holy Spirit, ever liveth and reigneth God, world without end. Amen.